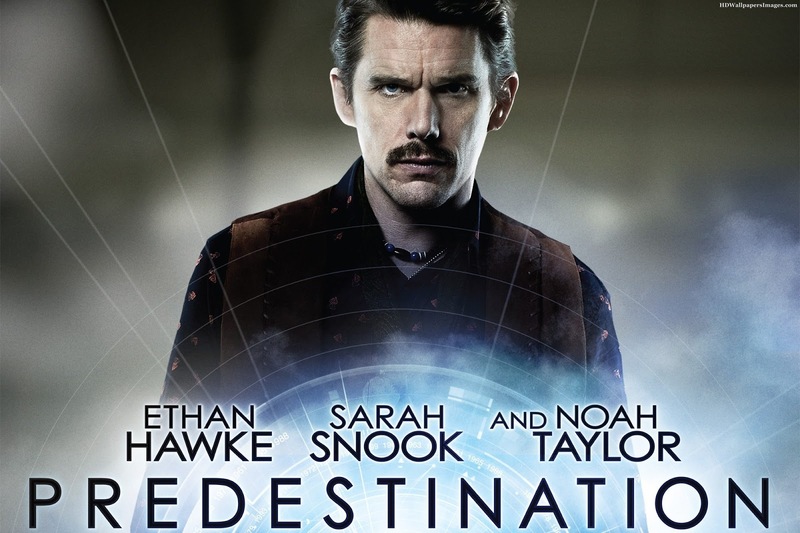 Predestination is a 2014 Australian science fiction mystery thriller film written and directed by Michael and Peter Spierig. The film is based on the Robert A. Heinlein short story "'—All You Zombies—'", and stars Ethan Hawke, Sarah Snook and Noah Taylor. The movie begins in medias res when a time travelling agent is disarming a bomb, which however explodes and burns his face. Someone approaches and helps him to grasp his time travelling device, bringing him to a hospital in the future. While the agent is recovering from facial reconstruction, we learn that he had been trying to avoid the "Fizzle Bomber's" attack on New York, in 1975. After his recovery he receives his last assignment. The agent moves to 1970 New York. As a bartender, he starts a conversation with one of the customers. The customer, John, reveals he writes true confession articles under the pen name "The Unmarried Mother". This pseudonym is explained by his biography. He grew up as "Jane" in an orphanage. As an adult she applied for "Space Corp", but she was later disqualified because of a medical condition. It turns out that Space Corp worked for the Temporal Agency, and this agency now wanted to recruit her. However, Jane fell in love and got impregnated. The agency broke off contact, her lover disappeared, her baby was stolen. Furthermore, she found out that she was intersex and that giving birth had led to implications that required her to become a man. Since then, John has been living a bitter life as "The Unmarried Mother". The agent suggests to take John back to the day that Jane met the man who had left her, so John can kill him. In return, John will take over the agent's job for whatever duration he wishes. On the particular day, John bumps into Jane and they begin talking. John now realizes that hé was Jane's lover. The baby born from this "self fertilization", suffering from a genital defect as a result, is taken by the agent to an orphanage 18 years earlier. Therefore, Jane, John and their baby are the same person, revealing a predestination paradox. The agent goes to 1975 New York as well, where he helps the burned man from the beginning of the film. John has to leave Jane behind and is brought to the Temporal Agency. He now takes over the job, so the agent can retire in 1970 New York. Somehow, the agent's travelling device does not decommission. He has been commanded to check a launderette on the moment that the Fizzle Bomber will be there. The Fizzle Bomber turns out to be the agent's own future self. The Fizzle Bomber insists that his actions have saved/will save more lives than the lives lost, and that they will ultimately lead to the reinforcement of the Temporal Agency. The agent denies he will ever become the Fizzle Bomber and kills his future self. The film finally reveals that in 1975, John travels to New York and burns his face while disarming a bomb – he consequently has the facial reconstruction that the agent had undergone. It is now clear that John would become the agent, and the agent would become the "Fizzle Bomber". In other words: the perfect temporal agent was responsible for both his conception and death – he has driven the predestination paradox to its limit. What is the password to extract the archieve ? ?